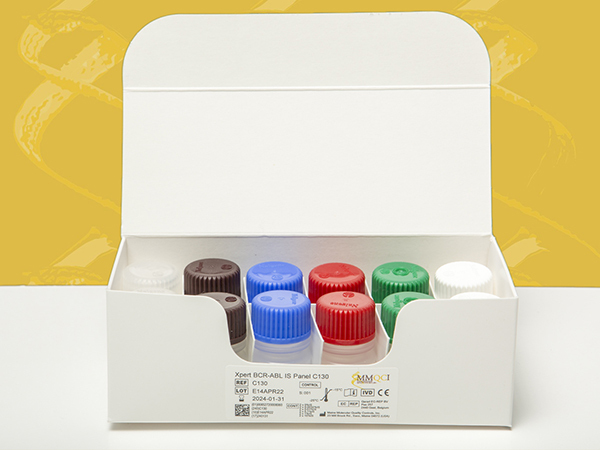 The Xpert BCR-ABL IS Panel C130 is intended for use as a reference material to monitor the performance of the in vitro quantitative detection of the BCR-ABL1 translocation mRNA e13a2/b2a2 or e14a2/b3a2 transcripts and the ABL1 endogenous control mRNA transcript when analyzed using the GeneXpert® BCR-ABL V2 assay, or the Xpert® BCR-ABL Ultra assay on the Cepheid GeneXpert Instrument Systems. The Philadelphia chromosome, a translocation between the ABL1 gene on chromosome 9 and the BCR gene on chromosome 22, designated as t(9;22), generates the fusion gene BCR-ABL1 which is present in most chronic myelogenous leukemia patients. Quantitative monitoring of BCR-ABL1 transcripts in patient blood is an important tool for measuring response to therapy. In 2009, the World Health Organization (WHO) developed a panel of four BCR-ABL1 primary standards to establish an international scale (IS), a standardized method for reporting assay results as a ratio of fusion transcripts to control gene transcripts (%IS), useful to the harmonization of patient care across laboratories worldwide.1,2 The Xpert BCR-ABL IS Panel C130 is designed for use with the GeneXpert BCR-ABL V2 and Xpert BCR-ABL Ultra assays which report on the international scale.